Welcome to another week of my guest post series Other Bloggers Family Lives. 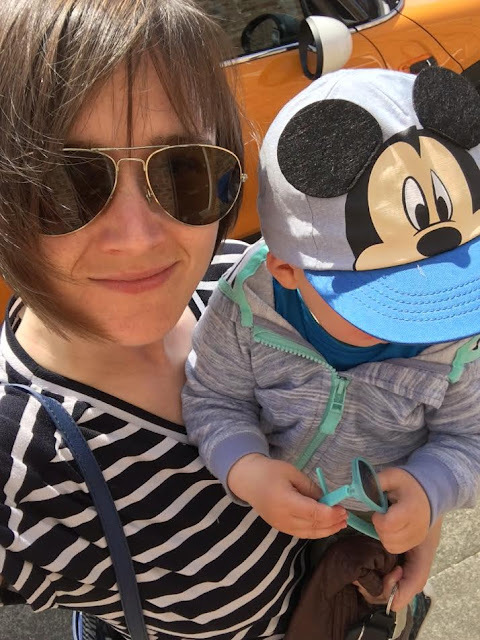 This week I am featuring fellow Geordie Laura from Three Days Later - which is a new blog about family life with a toddler, tips and general lifestyle posts. So let's find out more about the family behind Three Days Later. Hello, my name is Laura. I have a lovely husband who I met during our first week at university, we've been together for 12 years now, married for two. We have a gorgeous little tinker of a son, who turned the big one last month! We live in Tynemouth, a lovely coastal town in the North East of England, with our two cats - ginger and white Ollie and little tabby Simba. On a normal day our favourite family activity has to be going for a walk along the coast, stopping off for a coffee and cake in one of the cafes and visiting the nearby park - our son absolutely loves the swings. The town hosts lots of events, particularly during the summer so our walks are even more fun on these weekends with street entertainment and music. Our favourite is the food festival - we're all big foodies! We are very fortunate and live in such a perfect area I don't think we would live anywhere else! We are a ten minute walk from award winning beaches, have a lovely park on our doorstep and boating lake. The countryside is a short car journey away, as is Hadrian's wall and family are nearby. It would be very nice to have a bigger house and a sea view though, a house with a garden for the little man to play in .... and a swimming pool would be very nice too! I grew up in a town called Cramlington which is about a 20 minute drive to where I live now. I have lots of great childhood memories of growing up there, including hours spent learning to swim in the local leisure centre, being able to walk to my best friends house's and taking trips shopping or to see PJ and Duncan concerts in Newcastle Upon Tyne. 6.) Do you have any exciting family plans for the year ahead ? We have just been to Centre Parcs on holiday , It was the first time just the three of us have been away. We don't get much family time together as I work weekends so I'm really excited about all the quality family time we'll have. My favourite thing about family life is spending time together as a little team. No partically doing anything special. just walks in the sun, snuggles in bed and the giggles we have - for me that's what life's all about. Thank you so much for taking part Laura, I loved reading your answers and I grew up in Cramlington and also spent many hours at the lesuire centre having swimming lessons on a Monday night, jealous you live in Tynemouth now as I adore it there. Don't forget to check out last weeks post featuring Little Miss And Mummy if you missed it. If you would like to take part in Other Bloggers Family Lives then please just send me an email at newcastlefamilylife@gmail.com , you don't need to be a parent to take part either as the questions can be easily adapted. I like that they are a ten-minute walk from the beach, sounds like heaven by the sound of it. Ours is a ten-minute drive! Lovely to get to know Laura - this is a really lovely series! I found this post very interesting. I would love to live close to a beach. This is a great way to get to know other bloggers away from their actual blogs.